Roof rats are smaller than Norway rats, but have a longer tail and bigger ears. Primarily nocturnal; some colony members are very cautious. They constantly explore their surroundings and tend to shy away from new objects and changes. Roof rats nest in the upper areas of structures, but can also be found under buildings, as well as in basements and sewers. Outdoors: They nest in higher places such as trees, but may also burrow in or under vegetation around a building. They are somewhat social, with several nests located within a certain area. Roof rats only need a half of an inch (2 millimeters) opening to gain access to a building. They feed at dusk and prior to dawn, but will forage, often in groups of up to 10 rats, throughout the day. Once they find a dependable food source, they will exploit it. They prefer to feed under protective cover. Indoors: Once established indoors, roof rats will follow the same route to food and water sources. Roof rats can damage and destroy products by gnawing, eating, and defecating. 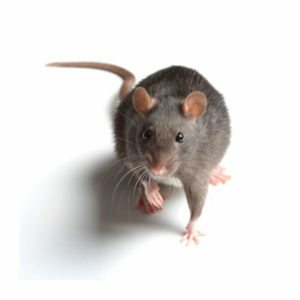 Rat bites and transmission of diseases to humans are not uncommon. However, the greatest concern is contamination of food, which may cause food-borne illnesses (e.g., Salmonella). Soft, smooth fur that is brown with black intermixed; white, gray or black belly. 6-8 inches (16-20 centimeters) and their tail measures 7-10 inches (19-25 centimeters). Adult head and body measure 6-8 inches (16-20 centimeters) and their tail measures 7-10 inches (19-25 centimeters). They can weigh 5-9 ounces (150-250 grams). Roof rats are more common in subtropical regions; however, they are spreading northward by living indoors. All kinds of food and seeds, but prefer naturally occurring seeds, nuts, fruits and berries. They also feed on insects including American, brown and smokey brown cockroaches. If near water, they’ll feed on fish, shellfish and other aquatic organisms. Pregnancy lasts 22 days. The young are born blind and naked, with hair appearing after seven days and eyes opening at 12-14 days. They are weaned at three to four weeks, and reach sexual maturity at two to five months. They average four to six litters per year, each with six to eight young. Adults live nine to 12 months. Their vision is poor and they are color blind, but have heightened hearing, smell, touch and taste. Touch is via vibrassae or long whiskers. They are good runners, excellent climbers and jumpers and, if forced, good swimmers. Keeping roof rats out of a structure that has vines growing on the walls or tree branches touching or near the building is difficult. Also, where roof rats are abundant, aerial utility wires must have barriers.